And arrives the second noitaminA show of the season, No. 6. This is show is kind of a change of pace for me. I typically steer away from shows like this, but the premise of this one sounded interesting enough to check out (especially given the other choices available). I’m rather wide open on my expectations on this show. I hope it will be good, but I’m always hesitant about shows like this (which is why I don’t always pick to watch them). Well, we get some brief history about how the city No. 6 came to be, and some hints that the city isn’t what it seems (even though we haven’t really seen much to suggest it’s much different, other than some suggestions that those with talents are provided pretty much everything they need, and the existence of the Moondrop thing. My first thought was that, I thought things seemed to happen a little too easily, or perhaps people accepted things a little too easily. On the one hand one might be able to accept this as Shion being naive, but Nezumi seemed largely the same way. He was a bit rougher, but it still just felt…odd. I don’t know if I’d say forced, but it was just weird to me. I just wasn’t sure about the writing overall in this episode. I definitely think it has potential, but it also has the potential to go off the rails too, I think. 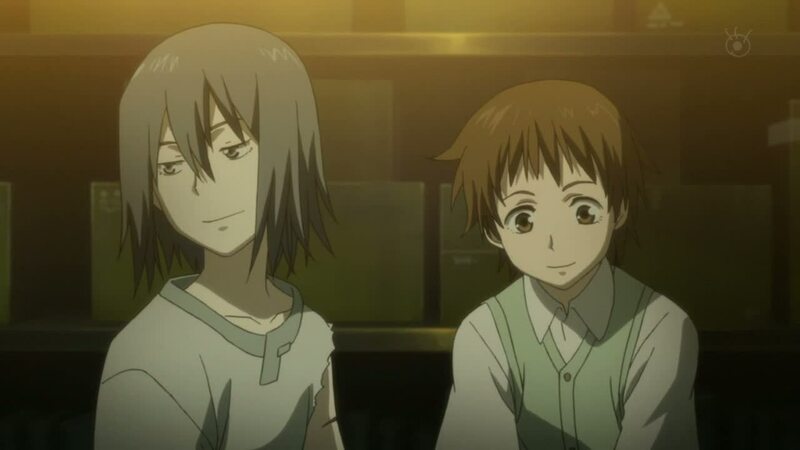 Naturally, it looks like Shion will get in trouble for sheltering Nezumi overnight, so we’ll see what happens with that (though one can guess from the show’s synopsis).